I borrowed this book via Riveted Lit. When I first saw this book making its rounds across the internet, I found myself curious of it but never actually sought it out to read. While following Riveted Lit's 25 Days of Free Reads, When Dimple Met Rishi was the first book available. I figured, why not? If I was ever going to read it, now was as good a time as any. So I downloaded the book and dug in! I was honestly surprised as easy of a book this was to read. It's been so long since I've read a nice simple book that I found myself sailing through this one at record speed. It was nice, easy, and quick to follow along with and the characters were fun to get to know. I really loved the the book was about a different culture than I normally read. This is one of the aspects of the book that drew me in because I love to learn about different cultures and their customs. It was really interesting to see the division between Dimple, who was born in America, and her parents who came to America and were more traditional in beliefs and customs. I really enjoyed the different personalities of Dimple and Rishi and they differed in their feeling towards their culture and the traditional beliefs and customs. 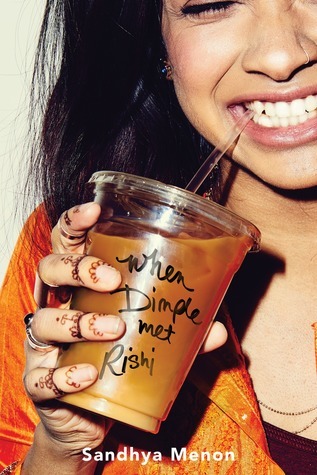 When Dimple Met Rishi, for me, was a nice, quick read. I definitely recommend it if you're looking for something easy and clean.